Cold, dark miserable mornings make getting out of bed a really unwelcome task and that is what it is a task, a chore and something I do not want to do. 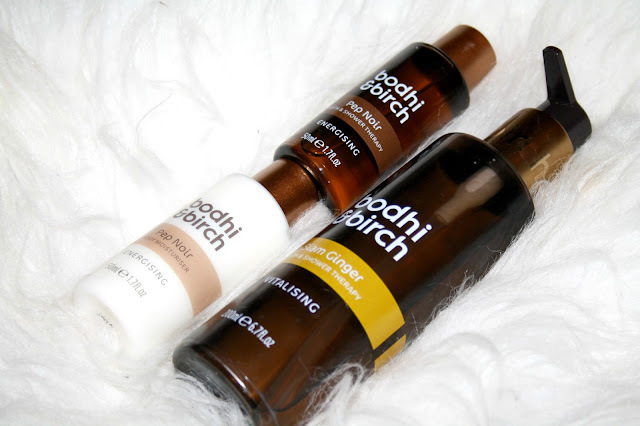 Having dragged my backside to the shower, there is one product that is guaranteed to make me feel as alert and awake had I just hopped into a cold shower and it is by Bodhi and Birch - Siam Ginger bath and shower therapy! "Invigorate and revive body and mind with an uplifting fusion of gingery Galangal Root, sharp Cardamom and fresh Kaffir Lime Leaf. Inspired by ancient remedies from the Far East, this is your home spa rejuvenation. Body and senses are vitalised and awakened. Skin feels refreshingly clean and alive with hints of ginger and spice"
GALANGAL - Warming oil with anti-bacterial, anti-fungal, antiseptic, anti-oxidant and stimulant properties. It is great for muscle aches and fatigue. KAFFIR LIME LEAF - Kaffir Lime Leaf has a sharp, aromatic scent. An indisputably effective cleanser, it refreshes and uplifts the spirit, eases depression, anxiety and a tired mind. CARDAMOM - Cardamom imparts a fresh lemony fragrance that is uplifting, benefiting those who are mentally and physically fatigued. TURMERIC - Turmeric contains curcumin which is highly anti-inflammatory and antioxidant. Also naturally improves skin complexion. LACTIC ACID - Lactic Acid is an alpha hydroxy acid with anti-ageing and skin rejuvenating properties. As well as waking me up of a morning, it also leaves me skin soft and smooth to the touch and you can also add it to your bath water which is perfect if you have aching muscles. I find that with a bad back, something I suffer from regularly, a bath with Siam Ginger helps to relieve that nagging ache. This has been an absolute delight to use and one I wouldn't hesitate to purchase and one that is added to the 'must have' products for the bathroom. I have to admit, I am not a big fan of the smell of ginger, but I bet the ginger and galangal helps with aches and pains. I will tell my husband as he's a runner and it may help him when he's complaining of joint pain. I bet with the ginger and the lime leaf it is really refreshig. Just what you need to wake you up in the morning. I'd definitely try this out if it helps soothe muscles in the bath. Yet another product to add to the list! Oh that looks fab, the packaging it so stylish and what a lovely combinations of ingredients. Sounds like a gorgeous way to start the day so invigorated. This sounds absolutely gorgeous, I really love ginger scented products! Love ginger and kaffir lime, they smell ah-mazing! I was in Thailand last week and they had soooo much ginger and kaffir lime everywhere - I was in heaven! This sounds so lovely, I definitely want to try it out! It's like everything that's good for you in one super bottle. Ready to boost you in the morning and get you on your way. It sounds divine! I love using zesty products in the morning to wake me up. Ive never tried anything ginger based though! I have only ever tried cardamom in food. Sounds really interesting, this. Nice packaging on this. I find I forget that I've bought some new skincare, but havne't come across this one before. I bet this is so refreshing and invigorating. I'm so into using spicy toiletries at the moment. Yes! I have a very bad back and joint and muscle issues and have just started physio so this is perfect for me. Does it ease out your knots and tension? The product sounds great. Im keen on cold showers though and ginger reminds me of my days with morning sickness... i had a lot of ginger! lol...but i would give this a try to see how it goes! Sounds great! I love the sound of this product and I want to try this. Sound like this would benefit for having a rough day and body aching. These sound like really lovely products, really invigorating and definitely good ones to wake you up in the morning. The packaging looks really great too. These look like really lovely products. Would love to try them. It sounds like it would really get one going. I like that it has turmeric in it too! I can't help looking at the ingredients and thinking that it looks like a good base for a curry! I'm sure that would make it very stimulating though. Linda, you made me laugh so much! That looks pretty cool! I'd love to try that. I'm sure it smells amazing. oh I really want to try this! It does look amazing! I love oils! especially in the morning after shower so perfect to me! I love the smell of ginger and galangal, so I reckon this product would suit me perfectly!